Hello everyone! This is Cassandra from Creating with Color by Cassandra. 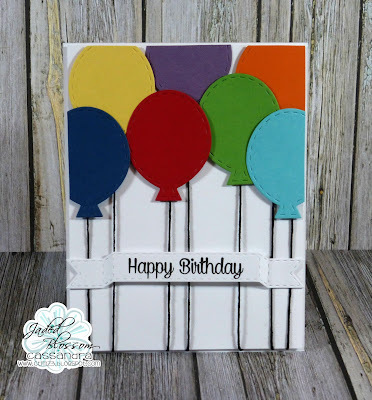 Today, I'm feeling the need for some pops of color . . . so here we go!!! Fun! Fun! Fun! Don't you think?! Hee! The best way to achieve some pops of color is against white. And of course, I always like to use all the colors of the rainbow . . . just makes me smile! 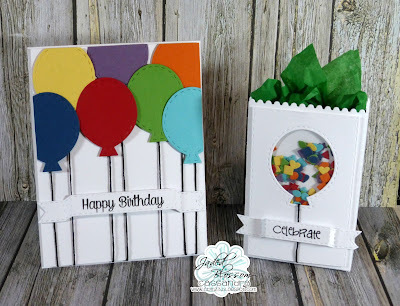 I cut these fun birthday balloons using the Jaded Blossom ~ Birthday Dies. 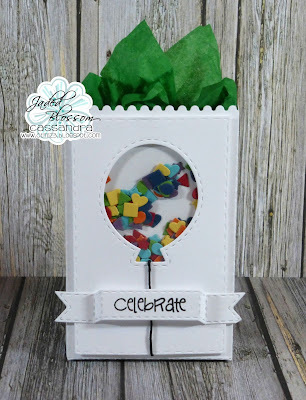 I cut the label with the Jaded Blossom ~ Dimensional Banner Dies. And the sentiment is from the Jaded Blossom ~ So Many Birthdays. I cut this using the Jaded Blossom ~ Goody Bag Die. And for some extra fun, I decided to make a little shaker window. So I cut the balloon and all the confetti inside the shaker using the Jaded Blossom ~ Birthday Dies. I cut the banner using the Jaded Blossom ~ Dimensional Banner Dies. The sentiment is from the Jaded Blossom ~ Sweet Birthday Wishes. Well my creative friends, that's it for me today. I will see you all again soon. Have a great day everyone! I am so excited to see your blog and end up at ground zero in my jumps. Much obliged to you to all you spectacular bloggers for doing this. I adored finding the opportunity to meet and gain from you at I'm working at write my essay is an incredible help for composing your own paper. I think my site accommodating you. Jaded Blossom Customer Blog Hop! We Go Together Like Biscuits and Gravy! The SECOND Jaded Blossom Customer Contest!